Luxury and New Contruction Specialist. 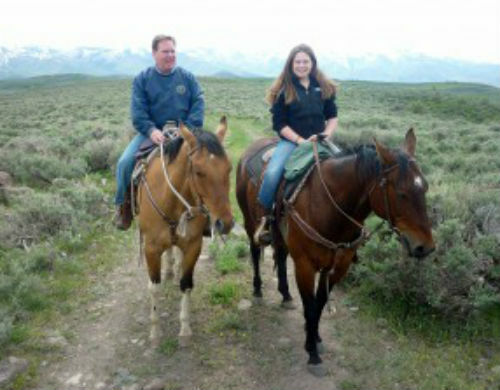 Home on the range in Utah with daughter MacKenzie. Passionate about real estate is the best way to describe Mike Palmer. Hardworking and loyal to his clients, Mike brings over thirty years of realty, building, and development experience to help his trusted Century 21 Commonwealth clients buy or sell their dream homes. A long-time Bay State resident, clients rely on Mike’s local knowledge, his genuine care for his clients, and his ability to connect the right home with the right buyer/seller. Mike’s love for all things real estate goes back to his teen years growing up in New Canaan, CT, a community known for its love of heritage. In high school, Mike spent summers and weekends working for the area’s best home building and remodeling companies. After high school, the Palmer family moved to Weston, MA. Mike juggled a cooperative education day job at IBM in Boston with evening courses at Boston College. On the weekends, Mike enjoyed working for Boston-area builders to offset college tuition bills. Eventually, Mike joined IBM as a full-time sales representative in Providence, RI, where he and his wife Stacey put down roots in Newport, RI. After buying and remodeling their first house together, they knew they shared a mutual interest that would outlast IBM. Over the years, they continued to remodel homes on the side while Mike obtained real estate licenses in both Massachusetts and Rhode Island. In 1985, Mike left IBM and founded his own real estate development company, PGI Industries, where he refined his real estate development career with a diverse portfolio of properties throughout Greater Boston, from residential remodels to creating new homes, condominium developments, and commercial properties. Building and remodeling will forever be at Mike’s core but today he and his team of highly skilled and seasoned professionals primarily focus on providing a higher level of realty services to their valued clients as part of The Palmer Group at Century 21 Commonwealth. This unique realtor/builder team is known for providing expert real estate representation with a customized approach: there’s no such thing as a perfect home, but Commonwealth Estates can help clients envision and create their own dream home. Their unique approach has been published in the Boston Globe and other area publications. Mike currently resides in Norfolk, MA where he and his wife Stacey are raising three children. Mike enjoys playing hockey, skiing, fishing, boating, horseback riding, and everything that has to do with real estate. Send Mike A Note Now.